Today's Cinco de Mayo celebration went off with a bang in Astoria, especially for my friends, Kimberly, Michelle and me, as we spent it at Mojave. Deciding to drop in on the earlier side, as they were featuring $5 Herradura margaritas at the bar and a live band, the place was packed to the gills. I apologize in advance for the poor photos. While I normally wouldn't share something of this quality, I still wanted you to have a visual prompter along with my descriptions. 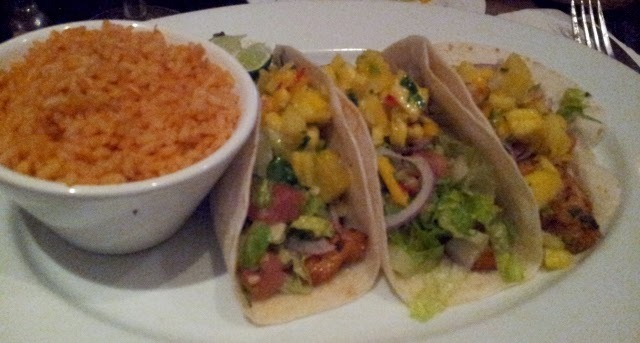 Fish Tacos - Mojave's catch of the day tacos were a light way to go, as the fish was grilled not fried and then topped with a fresh pineapple, onion salsa. While I can't say the tacos were overly flavorful, they were easy to put down, especially when embellished with Mojave's chunky guacamole. Note that the portion is large and totally conducive to sharing with another person. Short Rib Quesadilla - Kimberly ordered this hearty, and a little bit indulgent quesadilla, which I got a big piece of as well. 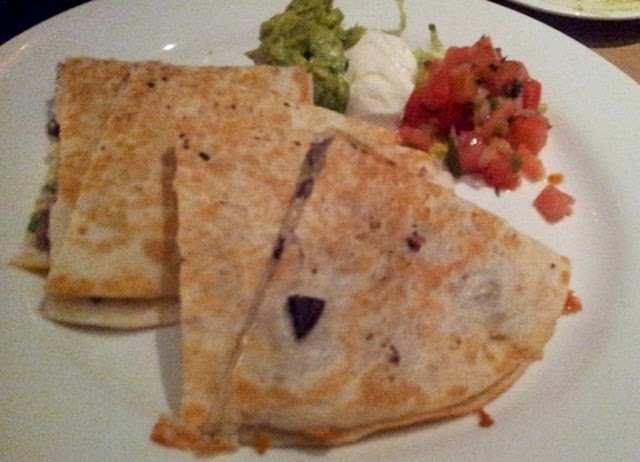 I enjoyed the smoky flavor of the short ribs which were generously distributed throughout the tortilla. Although I love me some cheese, I thought there was a tad too much of it in this and would prefer them to be heavier handed with the roasted corn, sweet onions, tomatoes and other veggies. 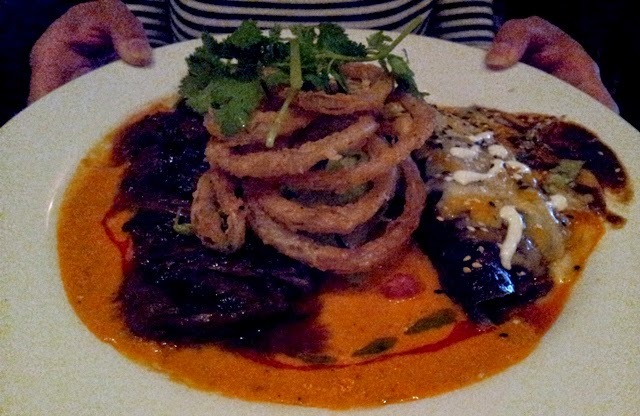 Steak and Enchilada Combo - Michelle's main course was the most impressive and a clear winner, in my opinion. The steak was cooked to a nice medium consistency and glazed with a deeply flavored mole sauce, which dressed the enchilada beautifully. An impressive stack of fried onion rings and a heap of fresh cilantro helped to garnish this already decadent creation. Margaritas - Washing all these goodies down with a refreshing fruit based margarita made this Cinco complete. Michelle and I went with the mango while Kimberly chose the blood orange--both flavors getting high marks on flavor, mild sweetness and a beautiful vibrant color. Given the very busy conditions that go along with Cinco de Mayo, it was impressive to see how efficient and organized Mojave's staff was. Our waiter was totally on point, and did a good job of anticipating our needs. We never felt we waited too long for anything and the staff was always up and about, so it was easy to get their attention. Costs are very fair for the fantastic atmosphere and the good quality of food. I'd definitely return again, and try a fancier dish such as the one Michelle got. We paid a total of $43/person including tax and tip.